Gestational diabetes mellitus (GDM) is a typical fetus development niches dysfunction and many toxic/nutrient elements have been associated with its onset and progression. However, the classic epidemiologic approach is regarded as “black-box epidemiology” and fails to elucidate these elements' biological roles on the damaged fetus developmental microenvironment. We aimed to characterize the associations between meconium of multiple elements with GDM for illustrating their interruption effects on in-uterus microenvironment. In this case-control study (n=137 cases; n=197 controls), the participants were nested from a cross-sectional retrospection of 1359 recruitments in Xiamen, China. Twenty-one meconium elements were characterized using inductively coupled plasma mass spectrometry (ICP-MS) or inductively coupled plasma optical emission spectrometry (ICP-OES). For shifting the present paradigm from a black-box approach to a molecular approach, GDM-related metabolic markers were identified in our previous metabolome report. 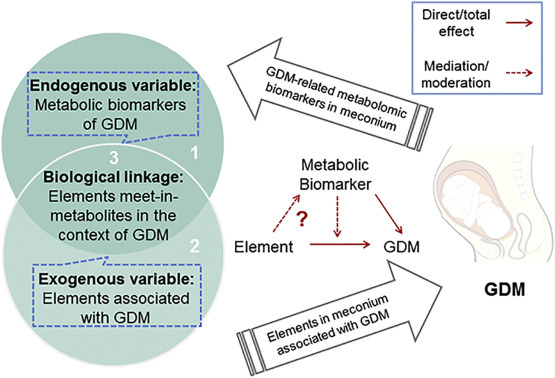 Based on the meet-in-middle strategy, the associations among the elements, metabolic markers and GDM incidence were assessed by using redundancy analysis and correlation-adjusted correlation; mediation analysis was further used to test the hypothesis that metabolic markers mediate the associations of the elements with GDM incidence. Eight elements were related with the GDM occurrence in dose-dependent manners, which positively (Al, As, Ba, Cd, Hg, and Sn) or negatively (Ca and V) associated with GDM. Among them, As, Cd, Ba, and Ca significantly contributed to the variation of GDM-related metabolic markers. Additionally, the associations of Cd, Ba, Ca and As with GDM were mediated by the metabolic markers which majorly involved in the lipid metabolism and the Adenosine/l-Arginine/Nitric Oxide (ALANO) pathways. The two-side mediations of meconium metabolic markers between the multiple elements and GDM occurrence indicated that maternal exposure to As, Ba, Cd, and Ca may be associated with the dysfunction of fetus development niche through disrupting lipid metabolism and ALANO pathways.